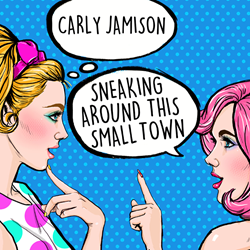 Songwriter and recording artist Carly Jamison has announced the release of "Sneaking Around This Small Town", a genre-defying new single that is an epic anthem and mini musical drama with a story of small town gossip, lies, and betrayal told through the use of country music verses, indie rock choruses and EDM synth hooks. Songwriter and recording artist Carly Jamison has announced the release of a new single today. "Sneaking Around This Small Town" makes its world-wide debut across all major music and streaming platforms. This new genre-defying single is a mini musical drama in its own right as it not only uses lyrics to tell its story about small town gossip, lies, speculation, and insecurity, but also different musical styles and genres to set the scenes. Country music, indie rock, and EDM are all seamless blended as the story progresses through verses and choruses. "I did not consciously set out to create a song like this", said Carly Jamison, "I didn't sit down and wonder what would happen if you combined all of these different genres. I just started hearing the song playing in my head one day and I specifically heard three, or four if you count the bridge, very different parts. I tried to record them as best as I heard them to be as true to the song and the story as possible." "Sneaking Around This Small Town" is distributed through OK!Good Records.